While Ben makes progress is locating the missing MA 828 passengers, his home life is dealt a huge blow. Meanwhile, Michaela and Jared get closer. 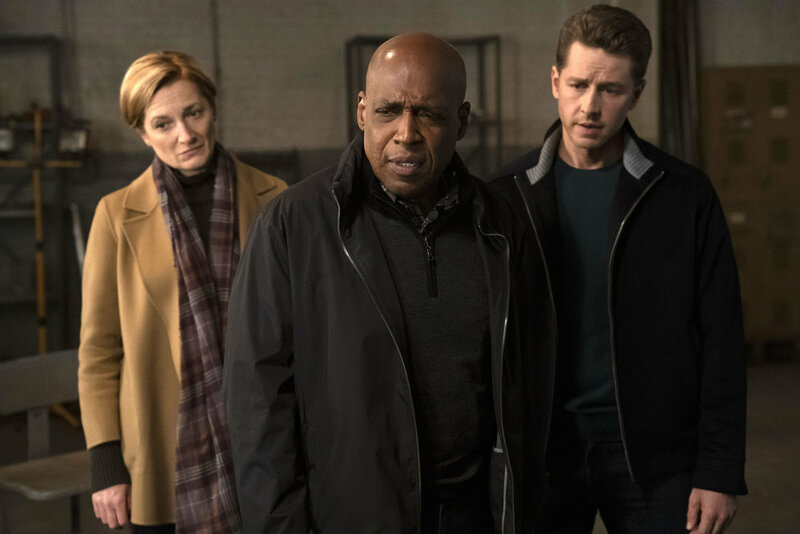 We review this week’s Manifest Fall Finale, “Dead Reckoning”. “Dead Reckoning” kicks off with the flashback to MA 828, the massive turbulence… and the aftermath of the passengers initial interviews with Vance. One of the interviews we hone in on is of Autumn Cox. Vance tells her that she has several outstanding warrants for her arrest, and almost immediately, Autumn is led away. In the present, we see that the team-up between Ben and Vance seems tenuous, but they do strike a plan to dig up dirt on the Unified Dynamic Systems/Singularity Project’s head guy, Laurence Belson. Vance plans to continue to monitor the location where the missing passengers are being kept and admonishes Ben to go home. At home, Grace is planning a barbecue for Ben to reacquaint himself with their friends. In order to get out of Grace’s hair, Ben offers to help Cal practice for tryouts for the basketball team. Cal remarks that his dad hasn’t been home that much lately… and we know that’s because Ben has been low-key trying to stop UDS/SP! Right as Cal starts to shoot some hoops, a bedraggled woman comes stumbling onto their driveway… it’s Autumn Cox! Apparently, she has escaped from UDS/DP and is seeking help. But why come to Ben? “I heard your name like my own voice in my head…” Yep, those are the callings that are linking the MA 828 passengers together! Ben immediately asks Autumn if she knows the people who has kidnapped her and the others. All she knows is that she refused to take the pills that she was offered and that there was a red door. That’s familiar… while Ben hides Autumn in the garage, he calls Michaela and tells Cal and Olive that he’s unable to hand out with them for the rest of the day. “I love you guys.” Almost like Ben is concerned he isn’t going to make it back home in one piece. Michaela, Fiona Clarke, Vance, and Saanvi also arrive on the scene and they see the extent of the UDS/SP electric shock “therapy.” It’s completely barbaric and Saanvi makes it known that she’s not at all happy with Fiona’s unethical research. The way she sees it, Laurence Belson wants results in this neuroscience research, by any means necessary. Ben knows that he has no more time to waste, and for the first time tells Vance that Cal is connected to Marko. Ben also tells Vance about the callings. Elsewhere, we see Belson and his team start the experiments again, the “Mirror Factor test protocol.” They have the missing passengers tied down on hospital beds and shock one person. While some of the others (not being shocked) feel the pain and react, others do not. The “scientists” speculate about why this might be the case. What’s connecting them? That’s when Belson tells them to increase the shock exponentially and everyone feels it… including Ben, Michaela, Cal, Saanvi. WOWSA. Vance assembles a tactical team, and the full force is descends on the chemical warehouse, including Michaela and Jared. However, the warehouse is totally empty. Curious. While Ben, Vance, Fiona, Michaela, and Jared speculate about what to do next, Cal arrives! “Dad! They’re still here!” yes, Cal is really out here in Brooklyn, with the picture he’s drawn, claiming that the missing passengers are there. Cal points to some trees off to the side and when Ben searches, he’s able to find a trap door that leads to some tunnels. Cal insists that Ben must go with the team because he’s the only one who will be able to see them. Because Cal has a fever, Michaela stays outside with him. Belson realizes that time in up and in order to cover their tracks, UDS/SP will kill the passengers they’ve captured… and everyone who’s connected to them via the callings. Fiona and Ben are able to take the electrodes off the passengers while Vance, Jared, and his team capture Belson. As Ben and Fiona are leading the passengers out, they get lost… and it seems Ben is the only one who can see the path lights to lead them out. This is really good news because this whole place is about to blow from a fire that breaks out! Once they’re outside, Fiona and the missing passengers are loaded into a van and presumably taken to safety. But then there’s a massive explosion that sends Ben and Michaela flying. When Ben wakes up, he sees a peacock. Random. Cal, sitting in the car, is OK, but Michaela is in shock. Ben insists that they leave, but Michaela has no intention of leaving Jared behind. He’s still in the tunnels, which are now unstable because of the explosion! Michaela is able to find Jared and Belson. Jared is in really bad shape and bleeding. When they get to the hospital, we find out that Vance doesn’t make it. Michaela waits by Jared’s bedside and begs… God, Fate… for Jared’s life. Later, Jared does wake up and he’s happy to see Michaela. It seems things have changed between these two… except Jared is still married. Js. Meanwhile, at the Stone house, while the barbecue is underway, men claiming to be investigators arrive looking for Ben. They tell Grace that Ben has been fired from his job… and has basically been lying this whole time. Grace is understandably upset… even more so when she realizes that Cal is missing and has been with Ben in a dangerous situation. When Ben and Cal arrive home, Grace is infuriated. She doesn’t want to have to bury her son again, and it’s clear she can’t trust Ben. This is devastating. The entire scene between Ben and Grace has me shook. And Olive is listening to the whole thing, too. Ben leaves by himself, and we have no idea where he’s going to go. Michaela meets Ben in the bunker. She tells him that she asked the callings to save Jared, and it worked. Ben, ever the man of science, doubts Michaela’s understanding of the events. Saanvi bring Autumn to meet them and they reflect again on Vance and his death. While Michaela and Ben leave to get food, Autumn pulls a burner phone out of her sock. YES, as we’ve suspected, Autumn is working with Belson and she’s meant to infiltrate Ben’s life to figure out what he knows. UHOH. 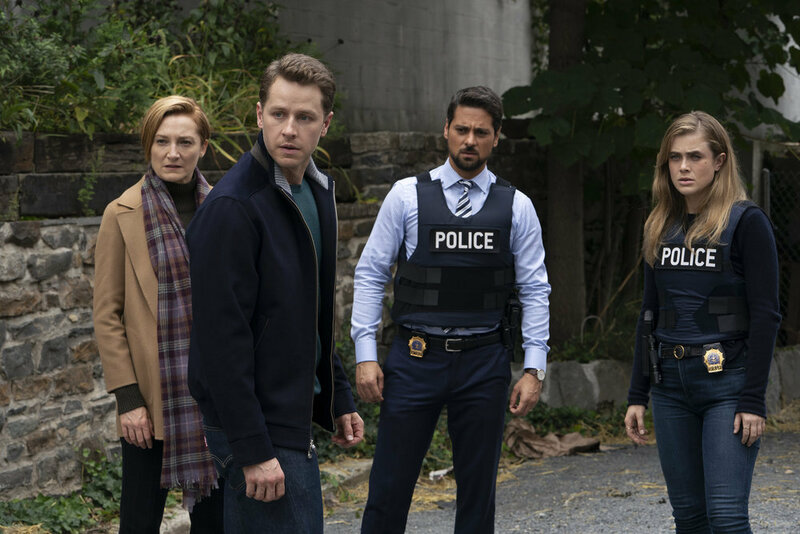 Manifest returns on Monday, January 7, 2019 at 10p/9c on NBC!